Edible statue to my idol, Cara. Thursday was Cara’s official milestone of quarter-life, but in true blowout fashion worthy of such an event, we are extending the festivities long into the weekend with a BBQ, a keg, and many many friends. The big fete will take place in Riverdale at Cara’s mother’s house, just a stone’s throw from our high school, where Cara and I met in the 7th grade corridor nearly 12 years and 1 month ago to this day. Cara was the prettiest 7th grader in existence, and I am still unsure if she ever experienced an awkward stage (mine lasted long beyond middle school). Her Mavi jeans, paired with the perfect pastel Michael Star t-shirt, fit like they were made for her, and she walked the halls with sun-kissed, white blonde hair, not an ounce of self-consciousness, and what seemed like all the impenetrable confidence in the world. Naturally, I was all at once terrified and envious of her. In Mrs. Cooper’s French class, we sat a few seats down from one another. On the first day, when we picked chic Parisian names, Cara chose Adele, and I immediately wished I had thought of it first. Instead, I was Monique, who happened to be the name of the saltshaker sitting on my parents’ dining room table (the pepper was Bob). To add insult to injury, Adele was also a lot better than me at French, and as it turned out for most of our shared activities, a lot better than everyone at everything. Eventually I got over my first year fear of Cara, and in 8th grade, albeit in different French classes based on level, we actually became more or less friends. We’d trade letters over the summer at camp, hang out at our friends’ houses on weekends, and sit in the cafeteria together during lunch (the truest sign of middle school friendship). But it wasn’t until junior year of high school that I actually felt like I got to know Cara. In possession of cars and the young adult freedom to leave campus during the day, we’d escape to get rich cappuccinos at a nearby café, drive around aimlessly and, occasionally, go home to Cara’s house to bake. This was a brooding “bitter blonde” stage we both found ourselves in, even if it was characterized by such tame influences as cars, cappuccinos, and chocolate chip cookies. We were so over high school, and did everything we could to get away. As we became closer, I came to know Cara as the old soul she’s always been (years beyond middle, and perhaps high school altogether). What I thought was cool kid clout in the early years was more accurately, unbelievable shyness. It was our quieter extracurricular activities that I enjoyed most in her company: sitting on city stoops, picnicking in Sheep’s Meadow, watching and judging countless people as they walked by. We may have traded and jokingly competed over oatmeal chocolate chip cookies, but my favorite times were when we made them together, gabbing away with her sisters around the kitchen island, while her mother’s electric mixer did all the work. Cara and I may have never given each other macramé bracelets in middle school, but I came to think of these treats as our friendship confections. Today, baking is one of the territories that distinguishes the two of us as differing grown-up individuals, and one of the many that still makes me think of Cara as my better half. Instead of trading, Cara for the most part will provide dessert for the dinners we share together, her talents for pie crust only getting stronger, while my impatience with measuring spoons grows all the more rapidly. But in honor of her quarter-life, I put my remedial skills back to work to craft a treat worthy of her 25 years, and all the Single White Female tendencies I felt 12 years ago. Years beyond the corridors of our high school (if only a few blocks away today), I know I don’t need proof of our friendship. But looking back at those early years, I feel all the more honored to share our current partnership. Today, we often do not enjoy our quiet moments and confections together in person, but I am grateful that we are always able share the memories of them with each other on the page. One day in high school, Cara’s sister Kate decided to bake me a sheet of rice crispy treats with my name written in chocolate chips. Unfortunately, I wasn’t in school that day. But I still think of the sentiment, and remember how much better these treats tasted when made by an Eisenpress sister. When I wrote Katie to ask about the special recipe, she said they merely used the instructions on the back of the marshmallow bag dreamed up by the visionaries at Kraft. Melt the butter in a large microwavable bowl for 45 seconds or until melted. Microwave for an additional minute or so, until the mixture is smooth. Stir in the cereal. Spread mixture on a greased 13 x 9 x 2-inch pan. Cover the top with plastic wrap and push down with your hands until the top is flat and the mixture is compact. Allow to cool completely. With a knife, loosen the sides of the crispy cake. Flip the pan over so the large treat lands on the plastic wrap. Transfer to a cutting board, and with a pairing knife, carve your friend’s name in bubble letters (handwriting we perfected in middle school). For best results, only make for friends with short, 4-letter names. Fall 2002: Ah highschool, what were we thinking. Aww, this is really sweet. It reminds me of my friends from Emma Willard, and how close we all still are. 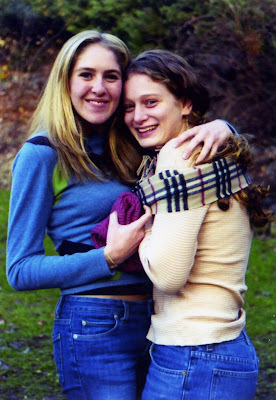 We were all roomies in NYC after college and did lots of cooking – thought it was pre-blog days! Love the crispy treats! This is so adorable, what a great post! 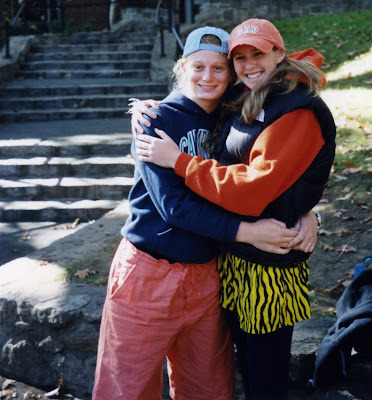 I love the pictures in your Fieldston orange. And P.S. that picture was taken in St John in the winter not summer, but who's counting? What a wonderful post!! This sounds like a tried and true recipe. I love the idea of dressing them up and cutting the krispies into shapes!! Happy birthday again, ca! Super cute! Thanks for the flashback. Wonderful and sweet post. Sad I missed the bbq on Saturday. Best post ever – love you both. Hoooray for my favorite blog-mates! And I can attest for all of you out there, having eaten the scraps from Cara's letters, the crispies were delicious.